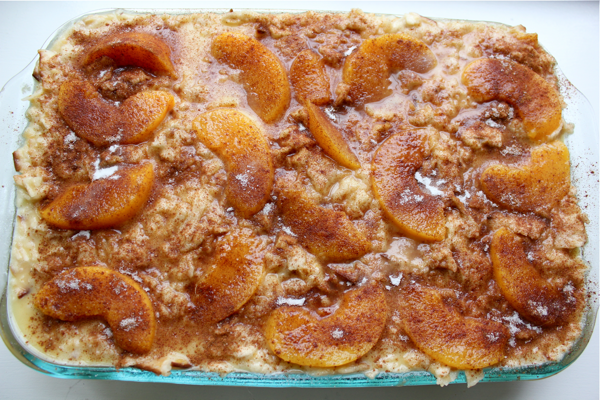 This Passover peach kugel is my mom’s specialty. I remember the first year she made it, everyone raved about it and has demanded it since. 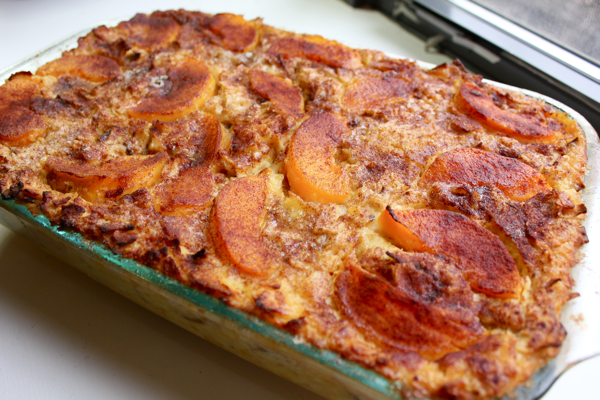 It is sweet and delicious, and its large peach slices make it a colorful alternative to the more ubiquitous (but equally as delicious) potato kugel. 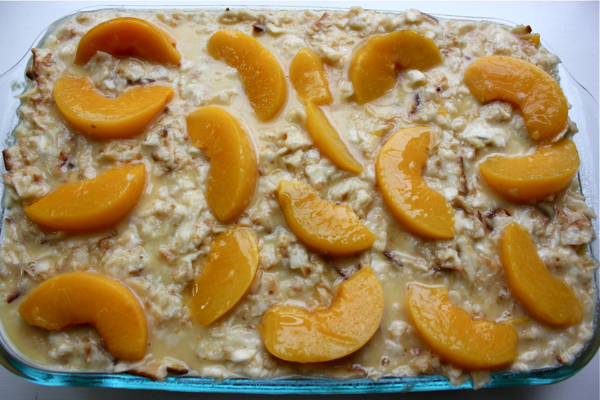 Until making the peach kugel myself, I always thought it had noodles in it. Nope- all matzah! The matzah is softened and combined with many eggs, so when it bakes, it takes on a very noodley consistency. To make it, preheat your oven to 350º F. Crush up a 1 pound box of matzah into 1/2 inch pieces, and add them to a very large bowl. Alternatively, you can use 1 pound of matzah farfel, which I believe is pre-crushed 1/2 inch pieces of matzah. 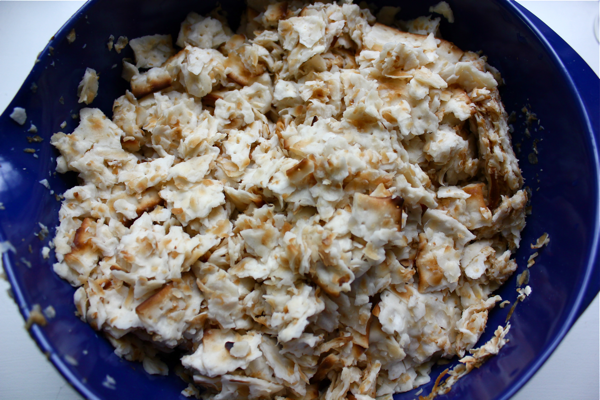 Fill the bowl of matzah with hot water, and let the matzah sit for about 5 minutes until it is softened. Then, strain the matzah, pushing down on it slightly to get rid of the water. Return the matzah to the bowl. While the matzah soaks, melt 3 sticks of margarine (3/4 pound), and let it cool. Crack 7 eggs into a separate, medium-sized bowl. Add the cooled margarine to the eggs, and whisk them together. Pour them into the bowl of matzah, and stir. Then, to the medium bowl, add 1 cup of sugar, 1 teaspoon of vanilla extract, and 3/4 teaspoon of salt. Open 3 cans (16 ounces each) of sliced peaches (the kind in juice, not syrup), and strain the peach juice into the bowl, keeping the peach slices aside. Whisk the peach and sugar mixture, and then stir it into the matzah. Grease a 3 quart baking dish. 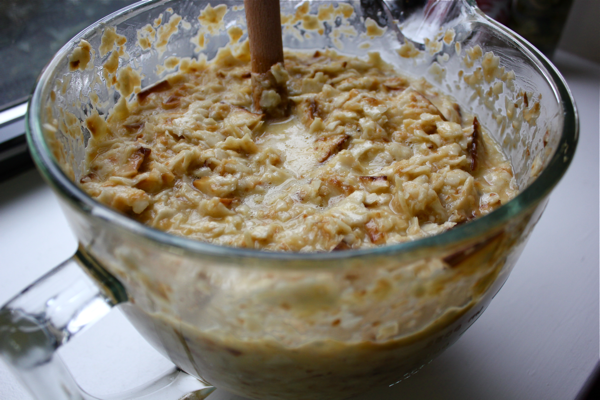 Pour half of the matzah mixture into the dish, and spread it evenly. Place half of the peach slices atop the matzah. Then, pour on the second half of the matzah mixture, and layer on the second half of the peaches, pushing them down slightly so they are flush with the matzah. Sprinkle the top of the kugel with cinnamon (approximately 2 tablespoons) and sugar (approximately 1/4 cup). Bake it, uncovered, for 1 hour until the matzah is set and the sugar on top has formed a nice crust. Let me know if this kugel reminds you of noodles too. And enjoy! Thank you for this! It looks wonderful and I can’t wait to try it. Since I’m alone, it’s been kinda hard to celebrate Passover. This will definitely help! why margarine ? could I use butter instead? Passover recipes tend to eliminate dairy (butter) so that you can serve the kugel with meat and keep Kosher. Butter and margarine have fairly different consistencies, so I might use a mix of butter and vegetable oil rather than swapping in butter completely. If you try the substitution, let us know how it turns out!